As shown in the Fig. 2(a), coil B is about to be short circuited. The brush is about to come in contact with commutator segment ‘a’. Suppose that each coil is carrying current of 10 A so that total brush current is 20 A as every coil meeting at the brush supplies half the brush current independently of lap or wave wound armature. As seen from the Fig. 2(b), coil B is entering short circuit period. The current in coil B has reduced from 10 A to 5 A as the other 5 A flows via segment ‘a’. The total current is remaining same at 20 A. But area of contact of the brush is more with segment ‘b’ than with segment ‘a’. Hence current of 15 A is from segment ‘b’ whereas 5 A from segment ‘a’. The coil B is in the middle of its short circuit period as shown in the Fig. 2(c). The current in coil B is reduced to zero. The current 10 A and 10 A pass to the brush directly from coils A and C. The total current is again20 A and the contact area of brush with the segments ‘a’ and ‘b’ are equal. As shown in the Fig. 2(d), the coil B is now under group of coils to the right of brush. The contact area of brush with segment ‘b’ is decreasing whereas with segment ‘a’ is increasing. Coil B is now carrying 5 A in other direction. Thus current of 15 A is passed via. segment ‘a’ to the brush while the other 5 A is supplied by coil C and passes from segment ‘b’ to brush. Again the total current is 20 A. 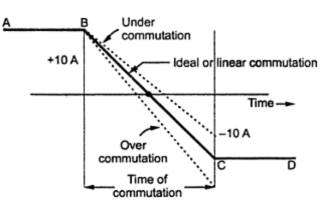 If case of ideal commutation is assumed then current through coil B will reverse at the end of commutation or short circuit period. But as shown in Fig. 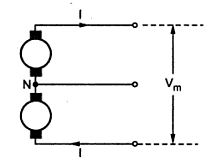 2(e) current flowing through coil B is only 8 A instead of 10 A. So the difference in coil currents i.e. 10 – 8 = 2 A jumps directly from segment ‘b’ to the brush through air and produces spark.